Boots are often the last piece of gear motorcyclists invest in. Protecting your feet is very important. Getting boots that fit you well is critical, otherwise you will despise wearing them. Good boots should provide ankle and shin protection. It is important that the boots stay on during a crash and/or slide to provide protection from impact and abrasion. Having soles that protect against crushing is also a feature worth considering. There are many styles and brands available, but the important thing is to pick a pair that works for you and wear them every time you ride. I'm always amazed when I see someone riding on the back of a motorcycle wearing flip flops! I recently purchased a pair of Vendramini Wynna Lady boots, and I absolutely love them! They provide all the protection needed and are comfortable to walk around in after riding. The three adjustable Velcro strips on the Vendramini Wynna Lady boots allow me to get a custom fit. Ride safe and often, and remember to wear your boots! 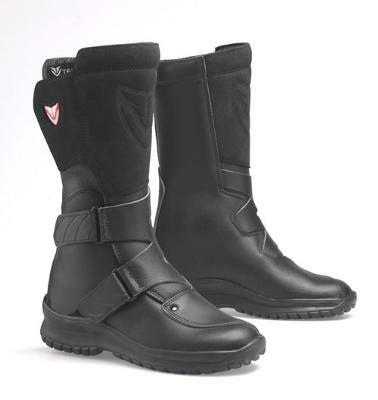 I fell in love with the ladies tour master waterproof boot. They have the reinforced pad on the left foot for the shifter. And they are super cute. You can wear them with anything. I'll have to check out the Diora Deuce boots. They sound nice. Sidi, TCX, and Held all have the shifter toe reinforcement, and I believe Alpine Stars does as well and at a lower price point. The reinforced shifter toe is a very nice feature. I agree that your foot wear is especially important in riding a bike. But it is hard to find a pair of ladies boots that have the extra piece over the toe for the gear shift. Men's boots have them but K can not find one pair of women's with that feature. If you know of any brand that has that feature, let me know. I just hate ruining my boot on the gear shift.